Look out, pigeons! Here comes Rufus! Wimbledon is legendary: the verdant green of the courts, the throngs of fans in sun hats, sightings of royalty ... and lots of pigeons. Since the tennis tournament at the All England Club began in 1877, pigeons nested in the stands and generally made a mess of things. Today, though, very few pigeons attend Wimbledon. Fans can thank falconer Wayne Davis and his Harris’s Hawk, Rufus. Davis flies Rufus over the Wimbledon grounds a few times a week throughout the year -- a truly scary sight for any other feathered visitors. For many years, since the tournament began in 1877, pigeons nested in the stands, bobbled about on the courts, and, well, made a mess of things. Yet today, very few pigeons attend Wimbledon. Fans can thank Wayne Davis and his Harris’s Hawk named Rufus. 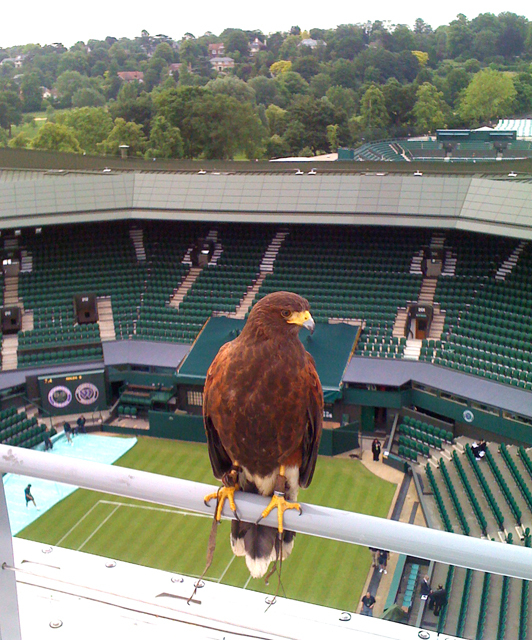 [Harris’s Hawk calls] Davis, a long-time falconer, takes Rufus to the Wimbledon grounds a few times a week throughout the year. Rufous soars over the venerable courts, a truly scary sight for any other feathered visitors. The pigeons get the message: move elsewhere, and don’t come back soon [sounds of pigeons taking off]. A non-toxic solution to that problem! Bird audio provided by The Macaulay Library at the Cornell Lab of Ornithology, Ithaca, New York. Individual Rock Pigeon cooing and several cooing recorded by A.L. Priori. Call of the Harris’s Hawk 140260 recorded by G. Vyn. Ambient audio by Kessler Productions. Sincere thanks to Geoffrey Ashman for his special assistance, and to Imogen of Avian Consultants, for securing the photo of Rufus!